The origin of the name Moldova remains somewhat of a mystery. One explanation is that according to legend, recorded by Moldavian Prince Dimitrie Cantemir in the 17th Century, the first Moldavian ruler Dragos, named the country after one of his hounds, Molda. His beloved hound died during the hunt of an aurochs in the lands of his future principality. Aurochs are an extinct type of large, wild cattle, with long horns. It remains a symbol of Moldova today and is proudly displayed in the center of their coat of arms and on the nation’s flag. Moldova is a small, landlocked country located in southeastern Europe, in the northeastern Balkans. It is bordered by Romania to the west and surrounded by the Ukraine to the north, south and east. Most of Moldovan territory lies between two main rivers; the Dniester and the Prut. Moldova has about 60 natural lakes, 3000 rivers and streams, and 2200 natural water springs. Three-fourths of the land area is bathed in a rich, fertile soil known as Russian black earth. Forests occupy about 11 percent of the land. The topography and climate makes the land rich in both flora and fauna. Moldova has more than 5000 species of wild-growing plants and more than 15,000 species of animals. Despite all this beauty, Moldova remains one of the least visited countries in Europe and one of the poorest. Moldova, being located strategically between Asia and Europe, was repeatedly invaded since antiquity. Between the first and seventh centuries AD, it was under the control of Roman and Byzantine Empires, followed by the Bulgarian Empires. The more recent history can be traced back to the 1350s when Moldavia, a principality that incorporated modern Moldova and Romania became part of the Ottoman Empire (from 1538 until 1918.) Following one of several Russian-Turkish wars, the eastern half of the principality, known as Bessarabia, (where most of today’s Moldova is located) was annexed by the Russian Empire. Bessarabia briefly became independent and then united with Romania. In 1940 it was annexed by the Soviet Union and remained so until the dissolution of the USSR. It became independent on August 27, 1991. There is a strip of territory on the east bank of the Dneister River, known as Transnistia, which has been under the control of a de-facto government and is considered to be an autonomous region of Moldova. Transnisitia has maintained its ties with Russia and Russian is the official language there. Since Independence, Moldova has struggled with government corruption and a there has been a tug of war between making alliances with the European Union and not upsetting Russia. However, November of 2016, Igor Dodon, a pro-Russian politician, won the presidential election in an extremely tight race. He hopes to restore ties with Russia, who placed a trade embargo on Moldovan wine, fruit and vegetables in 2014, after Moldova signed an association agreement with the European Union. There is an on-going controversy on whether Moldovans are a fully-fledged ethnic group or really a subgroup of the Romanian ethnic group. Moldovans make up 76 percent of the population with the balance being Ukrainian and Russian. The official language is Moldovan which is virtually identical to Romanian. Russian and Gagauz (a Turkish dialect) are also spoken. Gagauzia is another autonomous region in Moldova located in the south. The majority of Moldovans there are Eastern Orthodox Christians. 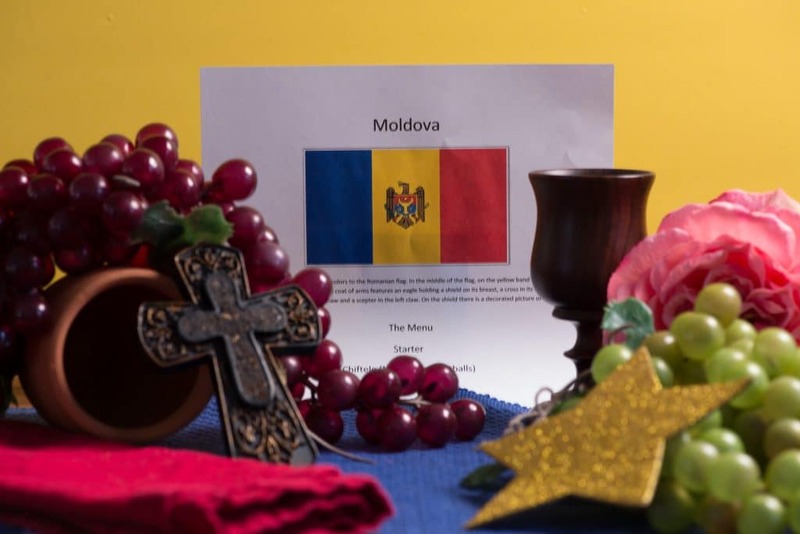 Other religions are found in Moldova, including Muslims and Jews. At one time there were large numbers of Jews in Moldova. However, during the Holocaust, thousands of Jews were put in ghettos and concentration camps and were killed or died of starvation and disease. Remnants of those ghettos remain. Today their constitution provides for freedom of religion. Agriculture plays an important role in the Moldovan economy. They are a major supplier of agricultural products for southeastern Europe. Wine production is extremely valuable to the Moldovans, as it provides an occupation for many of them. Most of the wine production is made for export. Many families have their own recipes and types of grapes that have been passed down through the generations. Milestli Mici is a commune composed of two villages and home to a large winery of the same name. It is also known as the oldest place of storage for the “holy drink.” It is home to the largest wine cellar in the world which holds nearly two million bottles. When you enter, a unique, giant fountain surrounded by huge wine glasses welcomes you. However water, not wine, flows from the fountain. Wine tourism holds great promise for Moldova’s future. As we look into the cuisine of Moldova, we see it is heavily influenced by its neighbors Romania and Ukraine. Additionally, it has Russian, as well as Turkish and even Greek influences. They share their national dish with Romania. It is a dish called Mӑmӑliӑ, a cornmeal porridge that is a staple alongside stews and meat dishes. It is often times garnished with sour cream, pork rinds and a cheese called brynza, made from sheep’s milk. We began the meal with a toast of red wine, and said “noroc,” (pronounced no-rock) which means ‘luck’ in Moldovan. We enjoyed the juicy, pork meatballs as our first course, called chiftele. These meatballs are common all over the region and are often served as appetizer. 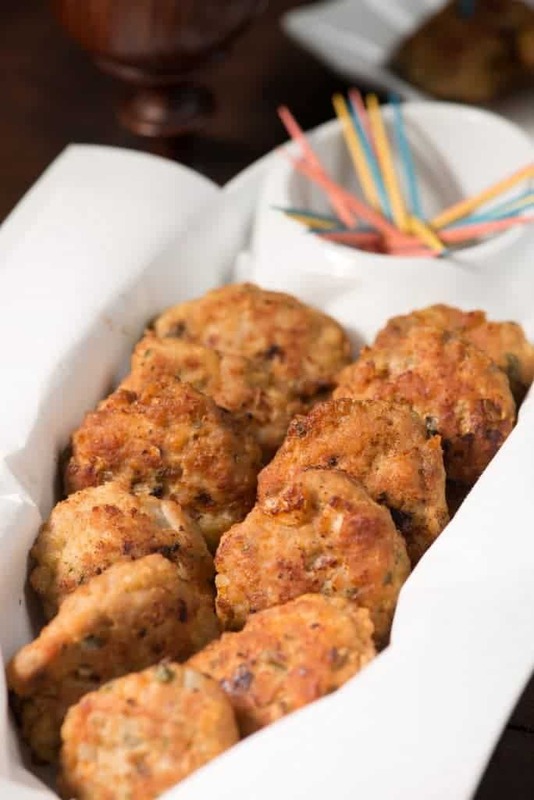 They are not round like typical meatballs but taste even more delicious a bit flattened out. 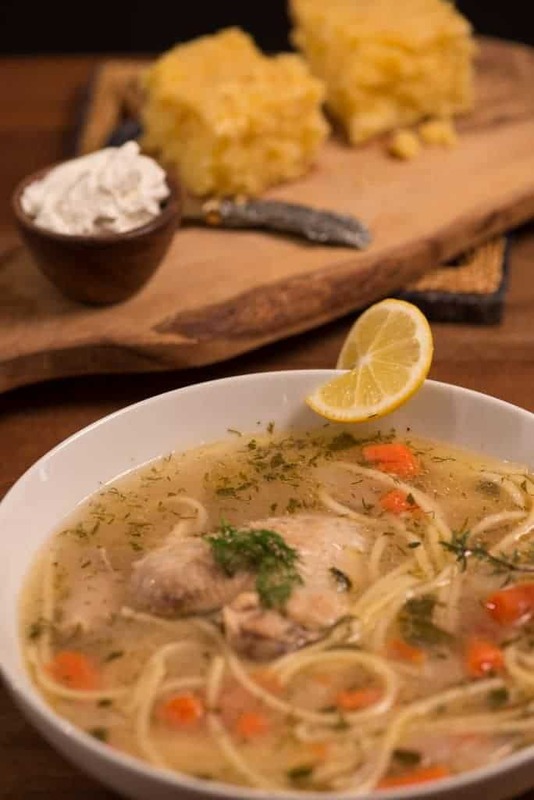 For the main course we had a famous Moldovan dish called zeama , which is a chicken noodle soup, enjoyed there throughout the year. Zeama is also a well-known hangover cure. This hot soup was particularly comforting to us on this cold winter night. The noodles are usually made from scratch by skilled Moldovan home cooks. The broth and flavorings of dill, parsley and lovage were exceptional. Lovage is an interesting herb that we grow in our International Cuisine garden. It looks similar to a parsley leaf and when tasted raw, it is a little bitter, like a celery leaf. However, when cooked in a soup or stew, it imparts an indescribably, delicious flavor, that we just love. We paired the soup with a yummy, hot corn bread made with cheese and sour cream. 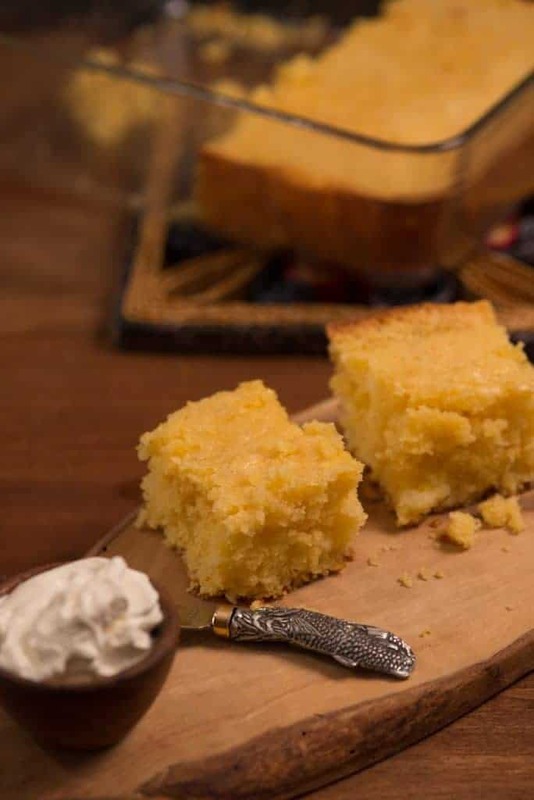 The result was a moist cornbread that went perfectly alongside the zeama. 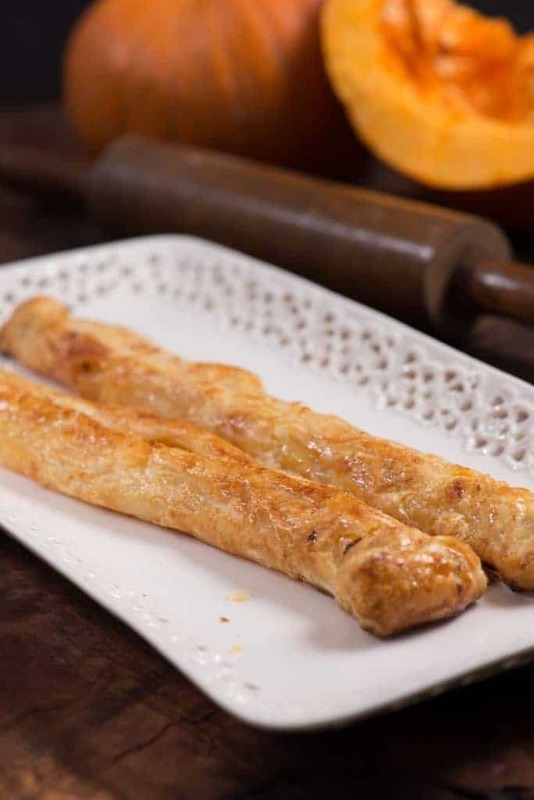 For dessert we served, Plӑcintӑ, a stuffed pastry that is made with many different fillings. Ours was made with pumpkin and topped with a bit of vanilla sugar for a wonderful ending to our hearty, Moldovan meal. “I consider Moldova one of the best kept secrets on earth, in fact. And, I am not alone.” Kevin Stillmock.